Objectives Construction of a primary school in the Bedouin village of Khan al Ahmar, using bio-architecture techniques, and support for children educational activities. Two thousand tyres for the right to education of Palestinian Bedouins living in Area C. What seemed impossible is now a reality: the Rubber Tyre school in Khan al Ahmar, a Bedouin camp located between Jerusalem and Jericho, is now home to more than one hundred children in the Jahalin community. Surrounded by Israeli settlements, the Bedouins live in conditions of extreme marginality, without any basic service. Many of these children had left school before our intervention. ARCò team (Architecture and Cooperation) planned the school in bioclimatic architecture and coordinated the team of local workers who realized the building in two weeks. In August 2009, the Palestinian Ministry of Education has officially recognized the building. The school, which was equipped with a photovoltaic system with the support of the Italian Cooperation, now houses five junior classes. In 2012, the project was exhibited at the XII Biennial of Architecture in Venice. 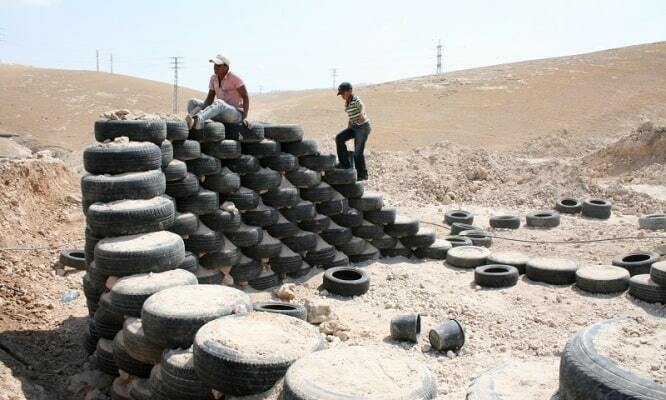 The building, “temporary” from the structural point of view, was built with tyres, clay and wood in order to respect the Israeli military regulations that prohibit the construction of non-temporary artifacts in the area C of the West Bank. The project received a wide media coverage and appeared on the main international networks. Nevertheless, the “School of Tires” is at the center of a complex legal matter. 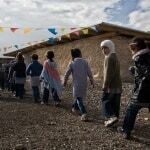 Our main goals are the right to education for Bedouin Palestinians children and the support of self-determination of local communities. We follow the school and the children who attend it step by step in the growth process, supporting teachers and promoting extra-curricular activities. The school, which is a destination of many international delegations, is under demolition order and under the pressure of the neighboring colonies. In defense of the right to education we launched the campaign: “Whoever demolishes a school is destroying the future”. Amnesty International, UNICEF and UNRWA joined our appeal.